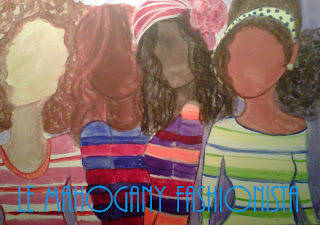 Le Mahogany Fashionista: Spring Stripes. Yes Please! Hey everyone! This is going to be a short and sweet blog post. In celebration of warmer weather and bright colors for Spring....Tada! No name yet. Working on it. You like? I could not wait to show you all, the first out of many. Stay tuned for more and make sure you check out my youtube channel this weekend. New V-blog soon! XOXOXO!